Saddam Hussein Abd al-Majid al-Tikriti was born on April 28, 1937, in a village called al-Auja, outside of Tikrit in northern Iraq. His father disappeared from his life either shortly before or shortly after his birth. It is said that this is because he was killed, while others say he simply abandoned his family. Saddam’s father remarried a man who was illiterate, immoral and brutal and in his youth, Saddam despised his living condition in close quarters with his step father. He hated it so much that he soon went with his maternal uncle, Khairullah Tulfah, after he was released from prison in 1947. After moving in with his uncle, Saddam started his primary level education at age ten. By age 18, Saddam graduated from primary school and applied to military school. Having aspired to joining the military for a long time, Saddam was devastated when he was unable to pass the entrance exam and was not admitted into military school. Subsequently, he moved to Baghdad and enrolled in high school, but soon found it boring, as he enjoyed politics more. His uncle, an ardent Arab nationalist, introduced him to the world of politics; Iraq which had been a British colony from the end of World War I until 1932, was bubbling with internal power struggles and one of the groups vying for power was the Baath Part, to which Saddam’s uncle was a member. Saddam joined the Baath Party at age 20, starting out as a low-ranking member responsible for leading his schoolmates in rioting. In 1959, however, he was selected to be a member of an assassination squad and on October 7, Saddam and others made a failed attempt to assassinate the prime minister. This forced Saddam into exile, and he lived in Syria for three months before moving to Egypt where he lived for three years. The Baath Party was finally successful in 1963 with overthrowing the government and taking power which allowed Saddam to return from exile. Once home, he married his cousin, Sajida Tulfah. After only nine months in power, the Baath Party was overthrown and Saddam was arrested in 1964 after another coup attempt. He was tortured for eighteen months in prison before escaping in July 1966. Over the following two years, Saddam became an important leader within the Baath Party, and was made vice president in 1968. His power increased over the next decade and on July 16, 1979, he rose to be president of Iraq. Saddam ruled his country with brutality using fear and terror to maintain his power and position. He led Iraq in war against Iran from 1980 to 1988 which ended in stalemate. During the 1980s, Saddam also used chemical weapons against Kurds within Iraq, including gassing the Kurdish town of Halabja killing 5,000 people in March 1988. In 1990, Saddam ordered Iraqi troops to take the country of Kuwait, and in response, the United States defended Kuwait resulting in the Persian Gulf War. America attacked Iraq on March 19, 2003, and during the fighting, Saddam fled Baghdad. On December 13, 2003, U.S. Forces found Saddam Hussein hiding in a hole, in al-Dwar, near Tikrit. After trial, Saddam Hussein was sentenced to death for his crimes. 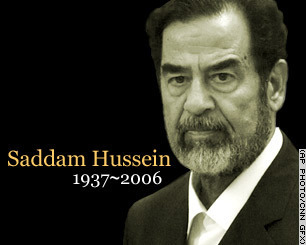 On December 30, 2006, Saddam Hussein was executed by hanging.